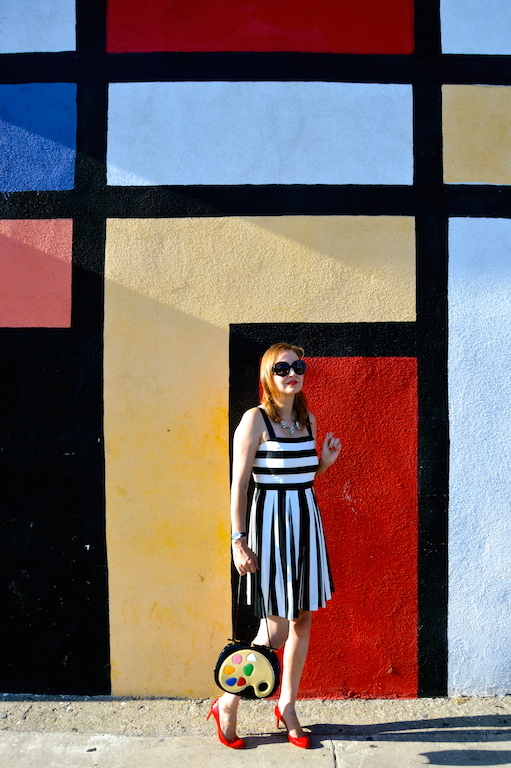 I've slowly been working my way through some of the most famous walls in Los Angeles this summer. 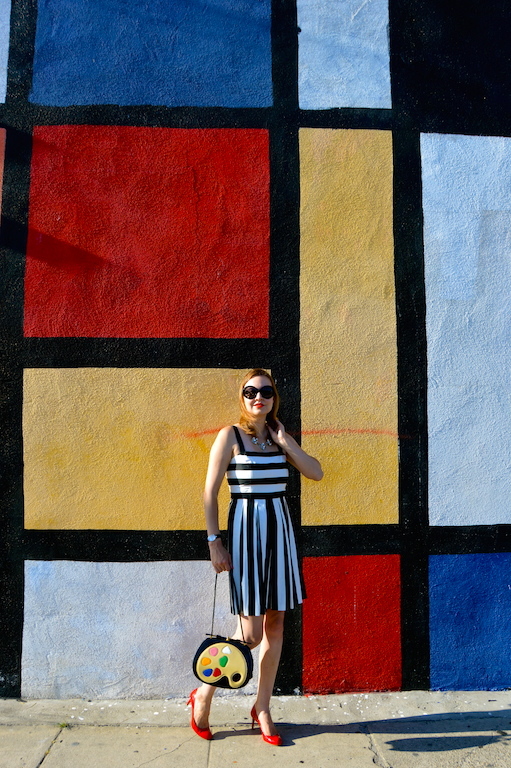 At the top of my list was this Mondrian inspired wall, which is right up the alley of someone such as myself who loves modern art. I didn't even realize that this wall is on the way to a restaurant that my husband and I go to at least a few times a year. It was hard to believe that it was right under my nose all this time! The thing is, when I got to the wall, it wasn't quite as impressive in person as the photos I'd seen of it previously. The colors are a bit faded and there is some graffiti and weeds all over the place. When I lived in New York City, my husband would always remind me that things look better on film than in real life (it was his subtle way of telling me he hated NYC), which I think is often true. 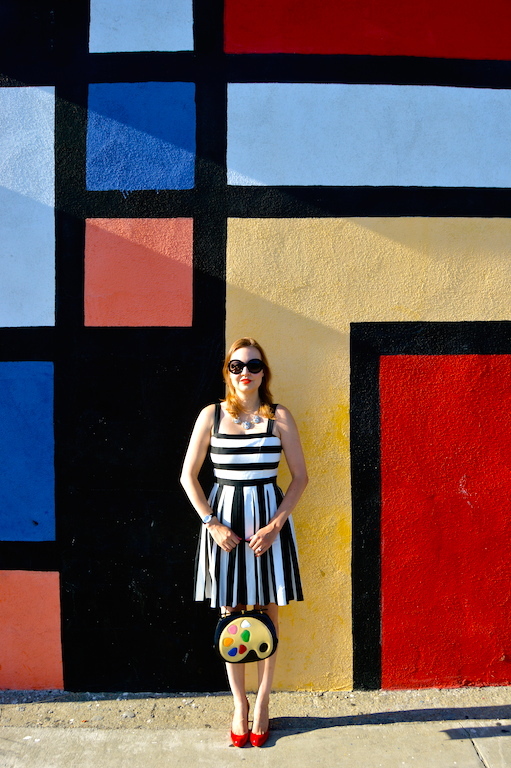 Since I knew in advance that I would be visiting the famous Mondrian wall, I planned ahead by taking out my vintage Moschino paint palette bag. I think this bag was made in the late 80s or possibly early 90s and the craftsmanship of it is fantastic, especially compared to many of the designer bags on the market today. The thing I love most about the bag is that it has its own paint brush, and I'm working the cheese factor in the last photo by pretending to paint with it. We took these photos right after closing time at the Artist and Craftsman Supply Store and I would have loved to see the expression of the employees coming out to see some crazy person pretending to be painting the side of the building, but I guess they've probably seen it all! Ha! I love that your bag has a brush attached. Perfect for those times when you have a painting emergency! Great choice of outfit for this wall. This may be my new favorite wall + outfit combo Katie! That dress is so, so gorgeous--simple stripes, but the way the stripes are done make it so flattering and pretty. And of course that bag rocks. 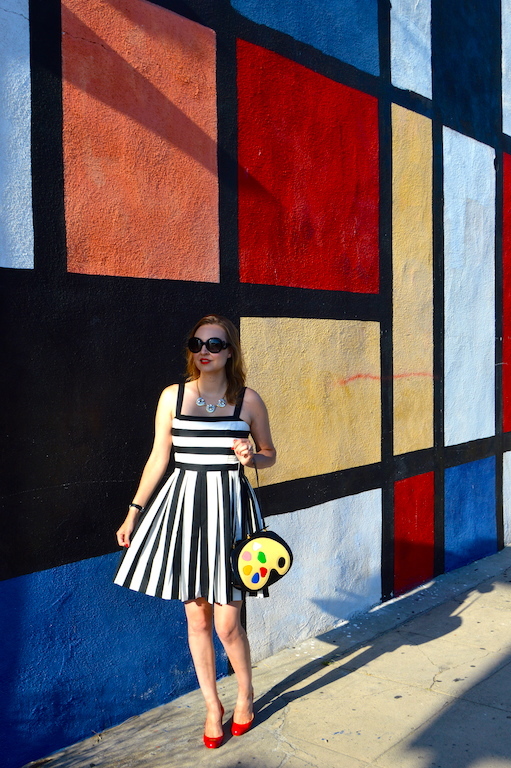 This outfit is so perfect for this wall and I love your collection of fun purses! Maybe the wall was underwhelming in person but it still looks fabulous as a fashion back drop! Gorgeous dress and photos! 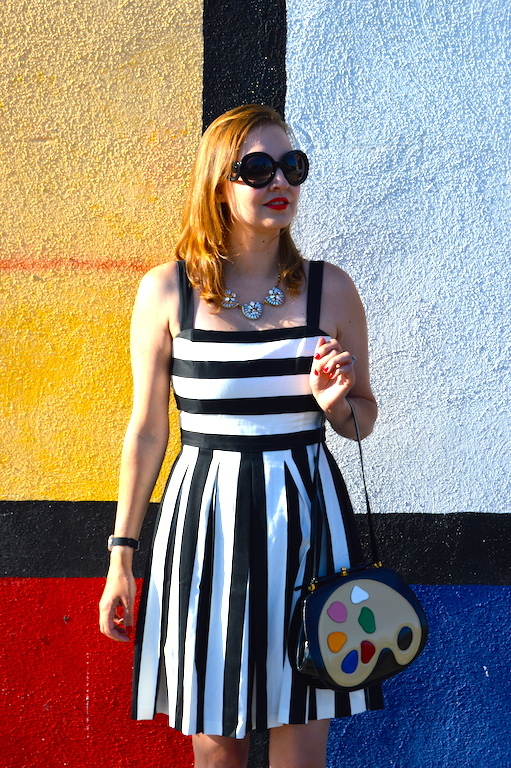 What a fun dress and bag! Your photo backdrops are always fun too! Love your dress... and that bag is too cute!